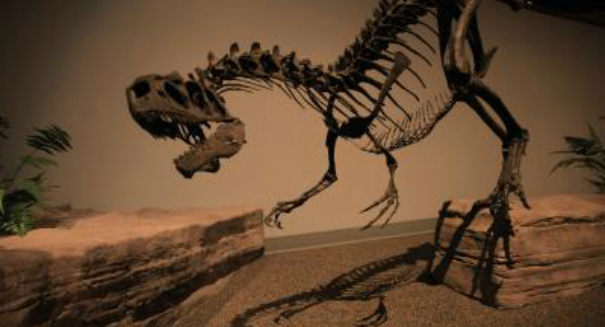 A new analysis suggests that dinosaurs evolved at a much more rapid pace than once thought. The fossil record provides us with the most accurate timeline of life on earth, but as far as most paleontologists know, it is woefully incomplete and thus paints a spotty picture of the history of the evolution of life. According to a report from Nature, the discovery of a rare new fossil indicates that everything we know about dinosaur evolution may be wrong. The finding suggests that dinosaurs rose to prominence on earth much quicker than previous estimates held. Paleontologists examined the fossils hidden in the rocks of northwestern Argentina to determine that the transitional period between pre-dinosaurs and dinosaurs was 5 to 10 million years shorter than researchers once thought. The study appeared in the Dec. 7 edition of the Proceedings of the National Academy of Sciences. The team analyzed the fossils inside of a rock formation called Chañares, home to the fossils of numerous dinosaurs and their direct ancestors. The rock is found below the Ischigualasto formation, which preserves fossils that are almost 230 million years old. The scientists dated the Chañares rock to determine when exactly the different types of fossils began appearing in the area. By measuring the ratio of uranium to lead found inside of the zircon crystals in the Chañares formation, the team was able to set a precise date for when the fossils became trapped, roughly 235 million years ago. Prior to the study, scientists believed that the fossils found in the Chañares formation were closer to 250 million years old. The discovery reveals that the formation was actually almost 10 million years younger than once thought. So what difference does a few million years make? According to Marsicano, a lot. The findings suggest that dinosaurs and their ancestors cohabited the same environment, and that natural selection gave rise to a wide range of new species in a relatively short amount of time. This suggests that the dinosaurs in the region were extremely resilient, and were capable of adapting to best survive in their surroundings. A press release from the University of Utah describing the details of the study can be found here.